It doesn’t matter if you’re gliding off the Great Plateau, setting sail from Kefalonia’s golden coast, or watching the gates of Vault 101 open before your weary eyes, the emotions are the same. A sense of fear and trepidation at the unfamiliar terrain that lies before you, yes, but also excitement, and a deeply primal ambition to explore every corner of this brave new world, and carve out your place in it. It’s the archetypal Homeric opening to a hero’s odyssey, and while the best is yet to come, let’s not forget what you’re leaving behind. Players will typically spend only a few hours at most in the starting zone of a video game, but by teaching you the ropes, tethering your character to a fixed place of origin, and contextualising the journey to come, they’re a valuable bedrock for anchoring the narrative of any interactive epic. And while many of these starting areas will look vastly different to each other, dependent entirely on the dictates of the game world, they all share the same subtextual DNA, collectively inspired by the timeless coming-of-age fables that have enraptured the human race for millennia. You usually won’t be able to leave a game’s opening area until the story decides that you’re ready, and developers achieve this ‘cordon sanitaire’ through a varying number of structural tricks. The easiest way to isolate the zone from the rest of the world is to make it an island, as is the case in the likes of Far Cry 5, Assassin’s Creed Odyssey, and several starting areas for certain races in World of Warcraft. 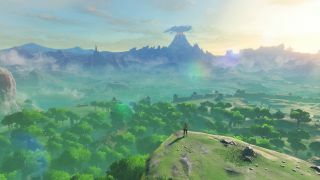 Other games like Breath of the Wild take a different tact, where the “island” becomes a raised plateau that can’t be descended until you’ve acquired a parachute to safely glide towards the plains below. The Embrace in Horizon Zero Dawn, meanwhile, takes the form of a walled community, whose gates won’t open until Aloy’s earned the right to leave as Seeker. Several RPGs - such as The Witcher 3 - will take a more hands-off approach, leaving you free to explore beyond the boundaries of your starting zone as early as you wish. You’ll soon learn, however, that the lack of a physical wall has been replaced by an invisible but no less effective level gate, and it won’t be long before a bunch of higher tier enemies send you crawling back to square mile one. However, a video game separates its starting zone from the wider world, though, the intentions are the same; to provide a sense of the ordinary that preludes and thus enriches the adventure to come. This “ordinary world” is what anthropologists have identified as the first chapter in the classic monomyth story, otherwise known as the hero’s journey. It’s Tatooine, Ithaca, The Shire, Kansas, Sandover Village, and more but, most importantly, it’s the place that our protagonist calls home. For that reason, these starter zones are almost guaranteed to be aesthetically pleasing, deliberately appealing to the senses as verdant pearls of warmth and humanity tucked away in a world of danger and malice. The areas are often populated by a modest community of kindly townsfolk, too, and while there’s usually some petty problems to solve in these otherwise congenial communes (a Radroach infestation, a missing Pokemon etc), they’re trivial matters compared to the grand quests and sights you’ll encounter beyond their borders. Consider the misty skies of The Wandering Isle, the blue yonder of Skyloft, or the sleepy nostalgia of Twilight Town. These places are treasured by many not just because they’re a first introduction to some of our favourite digital landscapes, but because they’re the kind of idyllic communities that we could envisage as a home for ourselves as much as the playable character. Indeed, without that contrast, the prospect of leaving this place of relative comfort and serenity wouldn’t be quite so daunting. The call to action that sends the hero away from peace and security to conflict and drama is thus the second stage of the monomyth, but it only works when that narrative transition is reflected by a marked change of backdrop. "Starter zones are a valuable bedrock for anchoring the narrative of any interactive epic." One of my favourite ways to cap off a playthrough of an epic, hundred-hours long role-playing game is to return to where it all began for my seasoned hero, and reflect on how far we’ve both come as player and protagonist. I’ve changed (as usually evidenced by my outlandishly OTT armour), but my humble homestead is still as charming and familiar as ever. Retracing the steps of my younger, naiever self as a seasoned hero invokes a strange, almost indescribable cocktail of sensations; an incongruous mix of nostalgia and loss akin to the experience of revisiting your childhood home as an adult. Whereas once this small, secluded stretch of land felt like my entire universe, my world-weary knowledge of its significance as a mere blip on a much larger tapestry has transformed my attachment to it forever. I cherish its existence more than ever, yet know I cannot stay anymore. The hero’s journey is a cyclical one, after all, and the return home is merely the precursor to yet another grand adventure that whisks us off to uncharted lands all over again. Read more about the best RPG games that you can play right now, or watch the video below for a look at all the new games of 2019 on the way this year.